Trial run of modified 'Wooden Ships' rules. Matt's trying to get them to play quicker so he can scale things up to Trafalgar size for next years St George's\May Day game. A modified version of the post Trafalgar Battle of San Domingo with some newly painted proxy ships. Should of been a one sided affair, since the French were out numbered 7 to 5, and although not out-gunned, there was a marked difference in crew and leadership quality. In general the Royal Navy should have most of the initiative, giving it an advantage in moving. 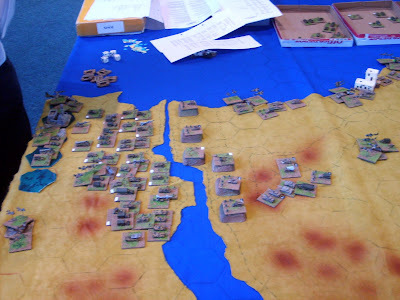 Arab-Israeli grand tactical scale game of the Egyptian attempt to seize the Suez canal and the Sinai in 1973, the Yom Kippur War. Israel has strong defensive positions to start but the Arabs have weight of numbers. Planes are a bit tough, with the idea of switching loads a bit flawed as they can change their emphasis from ground support to air superiority while in mid flight. Despite having to do overrun attacks the low offensive capabilities of their opponents make them virtually invulnerable and they can just bounce from hex to hex cleaning stuff out. The game will eventually include a Golan Heights/Syria section so the Israelis will have to select how they divide their forces up. At the moment it's just a rush westwards for the Israeli forces. Round to Matt's for a game of 'In The Grand Manner' his favorite set of Napoleonic rules. 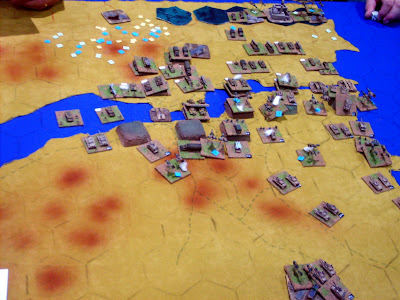 Set in an undisclosed place in the Peninsular (Iberian not Furness), the French have launched a surprise attack against the allied flank. The Spanish forces had been given the job of holding a farm on that flank, or, given the disparity in the sizes of the forces engaging, at least delaying the oncoming French advance. Well a surprisingly good season in Battrick has come to an end, with 2 first places and a second place, in a season where I feared at least one relegation. Managed to clinch FC promotion with a game to spare. It was only at near the half-way point of the season that I figured that I had a chance at success, and from then on fielded a near full strength side. Almost blew it straight off as for one game I forgot to set orders and my default side, which was filled with useless players, took the field. This was my only FC loss for the season.